A screen showing the Oscar nominees for Best Picture as announced by actor John Krasinski and Academy President Cheryl Boone Isaacs during the Academy Awards Nominations Announcement at the Samuel Goldwyn Theater in Beverly Hills, California, Jan. 14, 2016. 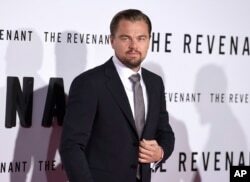 The survival epic The Revenant and the science fiction tale The Martian are among the top nominees for this year's Academy Awards, or Oscars, announced early Thursday in Beverly Hills, California. The two films are among the eight nominated for best motion picture, which also include Mad Max: Fury Road, the latest installment of the Australian post-apocalyptic drama, and Bridge of Spies, based on a true tale of Cold War espionage. Contenders for best actor include Leonardo DiCaprio for The Revenant, Matt Damon for The Martian, Bryan Cranston for the Hollywood drama Trumbo, and Eddie Redmayne, who played a transgender woman in The Danish Girl. Michael Fassbender is a nominee for his role as technology pioneer Steve Jobs in the film Steve Jobs. FILE - Leonardo DiCaprio arrives at the at the world premiere of "The Revenant" at the TCL Chinese Theatre on Dec. 16, 2015, in Los Angeles. Best actress nominees include Cate Blanchett for Carol, a story of a romance between two women, and Jennifer Lawrence for Joy, the true tale of a woman who created a business empire. Brie Larson is a nominee for her role as a mother held captive with her child in the film Room. Actress Cate Blanchett, wearing a Tiffany necklace, arrives at the 87th Academy Awards in Hollywood, California, Feb. 22, 2015. Oscar contenders for supporting performances include Mark Ruffalo and Rachel McAdams for Spotlight, based on the true tale of the Boston journalists who uncovered the child abuse scandal in the Catholic Church. Rooney Mara was nominated for Carol, Tom Hardy for The Revenant, Christian Bale for The Big Short, and Sylvester Stallone, who played a coach in the boxing drama Creed. Nominees for best director include George Miller for Mad Max: Fury Road, Alejandro Inarritu for The Revenant, and Tom McCarthy for Spotlight. As always, there were snubs. Ridley Scott was absent from the list of best directors, despite key nominations for his film The Martian. Michael Keaton failed to get a nod for his supporting role in Spotlight, or Johnny Depp for his starring role in the true-life gangster tale Black Mass. Steven Spielberg failed to make the cut for directing Bridge of Spies, and African Americans who were notably missing include director F. Gary Gray for the hip hop story Straight Outta Compton. This year's foreign language nominees include the Arabic-language Theeb from Jordan, about a Bedouin boy who accompanies a British officer through the Arabian desert during World War I. Hungarian entry Son of Saul is a Holocaust drama. Embrace of the Serpent, from Colombia, is about an Amazon healer, and A War, from Denmark, tells a tale of Danish soldiers in Afghanistan. Mustang, a French film set in Turkey, tells the story of five orphaned sisters. 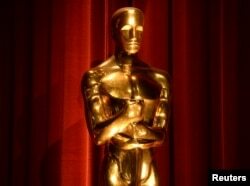 The Oscars, considered the top award in the American movie industry, will be presented February 28 at the Dolby Theatre in Hollywood. An Oscar statue is seen during the nominations announcements for the 88th Academy Awards in Beverly Hills, California, Jan. 14, 2016. Actor John Krasinski (L) and Academy of Motion Picture Arts and Sciences President Cheryl Boone Isaacs announce the nominees for the Best Actress in a Supporting Role during the nominations announcements for the 88th Academy Awards in Beverly Hills, California, Jan. 14, 2016.